The clear water surrounding the Marshall Islands is home to more than 1,000 species of fish and 250 species of coral. It is considered one of the best places in the world to scuba dive. In October 2011, the government created the world’s largest shark sanctuary—an area covering nearly 772,000 square miles (2,000,000 square kilometers) of ocean. There are at least 22 shark species in the waters around the Marshall Islands, including Blue shark, Silky shark, Bigeye thresher shark, Pelagic thresher shark, Oceanic whitetip shark, and Tawny nurse shark. Kamlitha [pronounced: kam-LITHA] first heard about the seventh-day Sabbath from her teenage son, Fredrick, whom she had sent to the Seventh-day Adventist mission school on a remote Pacific island in the Marshall Islands. But the mother of eight was determined not to leave her Sunday church. Kamlitha told her son that she wouldn’t change her mind just because he was excited about his ninth-grade Bible class—and she wasn’t going to embrace a church that worshipped on Saturday, the wrong day of the week. “Search the Bible for yourself, and you will see that I am telling the truth,” Fredrick replied. Kamlitha had chosen Ebeye [pronounced: EE-by] Seventh-day Adventist School for her eldest child because she wanted him to have a Christian education and the school was close to their home. It also had a reputation for having student missionary teachers who taught better English than the English offered in other schools. Fredrick kept sharing Bible truths and memory verses from school with his mother. He especially loved to recite Matthew 6:33, which says, “But seek first the kingdom of God and His righteousness, and all these things shall be added to you” (NKJV). He also defended the prophet Ellen G. White. Kamlitha was impressed with her son’s convictions and knowledge of the Bible. But she resisted his appeals and turned down repeated invitations to visit the Adventist church. She didn’t object, however, when Fredrick announced that he had decided to be baptized. In private, she prayed constantly, asking God if she was attending the right church and, if not, to reveal the true church. Then a drought struck. The already scarce fresh water supply dried up on Ebeye, an island where 12,000 people, half of them under 18, live on just 80 acres (32 hectares) of sand. Kamlitha joined other residents in a daily trek to the dock to fetch water ferried in from a nearby U.S. military base, the island’s main employer. Standing in line for water, Kamlitha met Andrea, a student missionary from Britain, who taught at the school. The two women met three days in a row, and on the third day, Andrea invited Kamlitha to study the Bible together. Andrea came to her home every day for a week. After her baptism, Kamlitha was invited to work as a teacher’s aide at the school and to serve on the church board. She also started to pray for her husband, Harold. For two years, she prayed for Harold, a chain smoker who drank heavily every evening after returning home from his job as a food service supervisor at the U.S. military base. Then Harold agreed to study the Bible with an Adventist pastor, and he gave his heart to Jesus. Kamlitha and Harold ended up sending all eight of their children to the Adventist school, and four of them were baptized. Two grandchildren also attended the school. 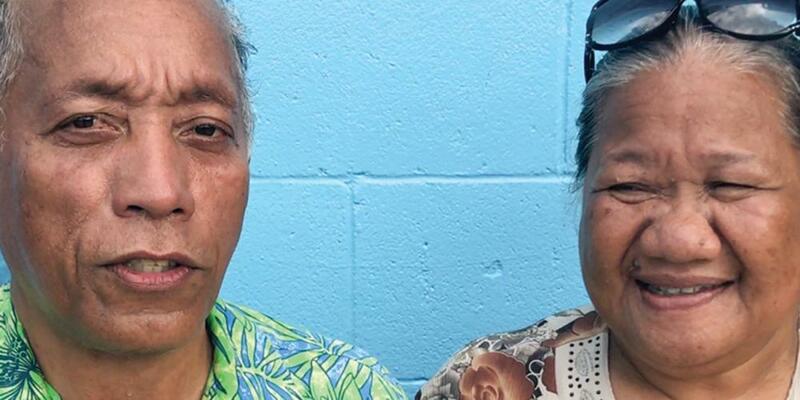 Harold, now 60, continues to work at the U.S. military base, and he also serves an elder at the Ebeye Seventh-day Adventist Church, which meets in the school’s main hall. About 60 people gather to worship every Sabbath. Kamlitha, 62, currently works as a Marshallese-language teacher at the Adventist school, and she gives Bible studies to friends and neighbors on Ebeye. Five people have been baptized. Now, Kamlitha is making plans to return to her native Maloelap [pronounced: malo-LAP] Atoll to plant an Adventist church. No Adventists live on the island of 150 people. Many lives have been changed in the Marshall Islands because Fredrick attended Ebeye Seventh-day Adventist School in 2003, Kamlitha said. “I really thank God that He chooses us and works in us miraculously,” she said. Part of this quarter’s Thirteenth Sabbath Offering will help Ebeye Seventh-day Adventist School carry out urgent repairs to its classrooms. Thank you for your mission offerings that will help more children—and their parents—learn about Jesus on Ebeye and beyond.